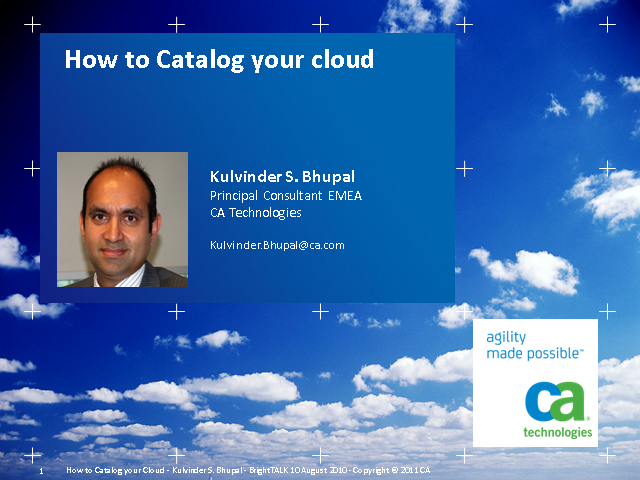 Join Kulvinder Bhupal from CA Technologies as he discusses how to catalog your cloud offerings and publish out IT/Cloud infrastructure services for business consumption. As more and more organisations turn to the promise that cloud computing offers, one of the major challenges is how IT present and manage these services for easy business consumption. The aim being that we want to use these services as we would any common household utility. The benefits of this are that your business service consumers can readily understand and access the cloud based services that are available to them and at what cost and service level. The request process is automated increasing IT agility with reduced service support costs.